Durga Puja, also called Durgotsava, is an annual Hindu festival in the Indian subcontinent that reveres the goddess Durga. It is particularly popular in West Bengal, Assam, Tripura, Odisha, Bangladesh and the diaspora from this region, and in Nepal where it is called Dashain. The festival is observed in the Hindu calendar month of Ashvin, typically September or October of the Gregorian calendar, and is a multi-day festival that features elaborate temple and stage decorations (pandals), scripture recitation, performance arts, revelry, and processions. It is a major festival in the Shaktism tradition of Hinduism across India and Shakta Hindu diaspora. Family and other social gatherings, shopping and gift-giving, feasting, pandal-visiting, lighting decorations, cultural events, idol immersion etc. Durga idol closeup from Railpukur par United Club, Kolkata. Durga Puja festival marks the battle of goddess Durga with the shape-shifting, deceptive and powerful buffalo demon Mahishasura, and her emerging victorious. [note 1] Thus, the festival epitomises the victory of good over evil, but it also is in part a harvest festival that marks the goddess as the motherly power behind all of life and creation. The Durga Puja festival dates coincide with Vijayadashami (Dussehra) observed by other traditions of Hinduism, where the Ram Lila is enacted — the victory of Rama is marked and effigies of demon Ravana are burnt instead. The primary goddess revered during Durga Puja is Durga, but her stage and celebrations feature other major deities of Hinduism such as goddess Lakshmi (goddess of wealth, prosperity), Saraswati (goddess of knowledge and music), Ganesha (god of good beginnings) and Kartikeya (god of war). In the Bengali traditions, the other deities next to her side are considered to be the children of Durga (Parvati). The Hindu god Shiva, as Durga's husband, is also revered during this festival. The festival begins on the first day with Mahalaya, marking Durga's advent in her battle against evil. Starting with the sixth day (Sasthi), the goddess is welcomed, festive Durga worship and celebrations begin in elaborately decorated temples and pandals hosting the statues. Lakshmi and Saraswati are revered on the following days. The festival ends of the tenth day of Vijaya Dashami, when with drum beats of music and chants, Shakta Hindu communities start a procession carrying the colorful clay statues to a river or ocean and immerse them, as a form of goodbye and her return to divine cosmos and Mount Kailash. The festival is an old tradition of Hinduism, though it is unclear how and in which century the festival began. Surviving manuscripts from the 14th century provide guidelines for Durga puja, while historical records suggest royalty and wealthy families were sponsoring major Durga Puja public festivities since at least the 16th century. The prominence of Durga Puja increased during the British Raj in its provinces of Bengal and Assam. Durga Puja is a ten-day festival, of which the last five are typically special and an annual holiday in regions such as West Bengal, Assam, Bihar, Odisha and Tripura where it is particularly popular. In the contemporary era, the importance of Durga Puja is as much as a social festival as a religious one wherever it is observed. This is an idol of Durga Goddess also known as Parvati. Hindus worship idols and this is one of it which is hugely celebrated among the Hindus. This photo was captured at Ram Krishna Ashram Rishra at the third day of the four-day celebration. In West Bengal, Bihar, Assam and Tripura, Durga Puja is also called Akalbodhan (অকাল বোধন, "untimely awakening of Durga"), Sharadiya Pujo ("autumnal worship"), Sharodotsab (Bengali: শারদোৎসব, ("festival of autumn")), Maha Pujo ("grand puja"), Maayer Pujo ("worship of the Mother"), Durga Pujo, or merely Puja or Pujo. In Bangladesh, Durga Puja used to be celebrated as Bhagabati Puja. Durga puja is also called Navaratri Puja elsewhere in India, such as in Gujarat, Uttar Pradesh, Punjab, Kerala, and Maharashtra, Kullu Dussehra in Kullu Valley, Himachal Pradesh, Mysore Dussehra in Mysore, Karnataka, Bommai Golu in Tamil Nadu and Bommala koluvu in Andhra Pradesh  and Bathukamma in Telangana. Durga is an ancient deity of Hinduism, according to archeological and textual evidence available. However, the origins of Durga Puja are unclear and undocumented. Surviving manuscripts from the 14th century provide guidelines for Durga Puja, while historical records suggest royalty and wealthy families were sponsoring major Durga Puja public festivities since at least the 16th century. The 11th or 12th century Jainism text Yasatilaka by Somadeva mentions a festival and annual dates dedicated to a warrior goddess, celebrated by the king and his armed forces, and the description mirrors attributes of a Durga Puja. The word Durga, and related terms appear in the Vedic literature, such as in the Rigveda hymns 4.28, 5.34, 8.27, 8.47, 8.93 and 10.127, and in sections 10.1 and 12.4 of the Atharvaveda. [note 2] A deity named Durgi appears in section 10.1.7 of the Taittiriya Aranyaka. While the Vedic literature uses the word Durga, the description therein lacks the legendary details about her or about Durga puja that is found in later Hindu literature. The Dadhimati Mata Temple of Rajasthan preserves a Durga-related inscription from chapter 10 of Devi Mahatmya. The temple inscription has been dated by modern methods to 608 CE. Durga, in her various forms, appears as an independent deity in the Epics period of ancient India, that is the centuries around the start of the common era. Both Yudhisthira and Arjuna characters of the Mahabharata invoke hymns to Durga. She appears in Harivamsa in the form of Vishnu's eulogy, and in Pradyumna prayer. The prominent mention of Durga in this popular epics may have led to her worship. The Indian texts that mention the Durga Puja festival are inconsistent. The King Suratha legend found in some version of the Puranas mention it to be a spring festival, while the Devi-Bhagavata Purana and two other Shakta Puranas mention it to be an autumn festival. The more ancient Ramayana manuscripts are also inconsistent. Versions of Ramayana found in North, West and South India describe the Hindu god Rama to be remembering the Surya (the Sun god) before his battle with the demon Ravana, but the Bengali manuscripts of Ramayana such as by the 15th century Krttivasa describe Rama to be worshipping Durga. According to Pranab Bandyopadhyay, the worship of fierce warrior goddess Durga, and her darker and more violent manifestation Kali, became very popular in Bengal region during and after the medieval era Muslim invasion. The significance of Durga and other goddesses in Hindu culture, states Patricia Monaghan, increased after Islamic armies conquered Indian subcontinent and attempted to deny iconographic representation of its male and female "idols". According to Rachel McDermott, and other scholars such as Brijen Gupta, the persecution of Bengali Hindus in Bengal Sultanate and late medieval era religious politics led to a revival of Hindu identity and an emphasis on Durga Puja as a social festival that publicly celebrated the warrior goddess. From the medieval period up through present day, the Durga Puja has celebrated the goddess with performance arts and as a social event, while maintaining the religious worship. The Durga Puja festival is a ten-day event, of which the last five mark the popular practices. The festival begins with Mahalaya, a day where Hindus offer tarpaṇa waters to their dead ancestors, as well the advent of Durga. The next most significant day of Durga Puja celebrations is the sixth day, called Shashthi where the local community welcome the goddess and festive celebrations are inaugurated. On the seventh day (Saptami), eighth (Ashtami) and ninth (Navami), the goddess along with Lakshmi, Saraswati, Ganesha and Kartikeya are revered and these days mark the main Puja (worship) with recitation of the scriptures, the legends of Durga in Devi Mahatmya and social visits by families to elaborately decorated and lighted up temples and pandals (theatre like stages). The Durga festival is, in part, a post-monsoon harvest festival observed on the same days in Shaktism tradition of Hinduism, as those in its other traditions. The practice of including a bundle of nine different plants, called navapattrika, as nature's symbolism of Durga, is a testament practice to its agricultural importance. The typically selected plants include not only representative important crops, but also non-crops. According to David Kinsley, a professor of Religious Studies specializing on Hindu goddesses, this probably signifies the Hindu belief that the goddess is "not merely the power inherent in the growth of crops but the power inherent in all vegetation". The festival is a major social and public event in eastern and northeastern states of India, where it dominates the religious life, with temporary stage (pandal) built in community squares, roadside shrines and large Durga temples. However, it is also observed by some Shakta Hindus as a private, home-based festival. The festival opens at twilight with prayers to Saraswati, the Hindu goddess of knowledge, wisdom, music, poetry, independent thought, inner knowing and creativity. She is believed to be another aspect of the same one multidimensional goddess Devi Durga, and who is the external and internal activity of all existence, in everything and everywhere. This is typically also the day that the eyes of all deities on the Durga Puja stage are painted, bringing them to a life like appearance. The day also marks prayers to Ganesha and visit to one or more Durga temples. The day two to five continue the remembrance and preparation to other aspects (manifestations) of goddess Durga, such as Kumari (goddess of fertility), Mai (mother), Ajima (grandmother), Lakshmi (goddess of wealth) and in some regions of the Saptamatrikas (seven mothers) or Navadurga (nine aspects of Durga). The sixth day launches the major festivities and social celebrations. It is called Sasthi (literally, sixth), the goddess is welcomed, festive Durga worship and celebrations begin in elaborately decorated temples and pandals hosting the statues. The first nine days overlap with Navaratri festivities in other traditions of Hinduism. A sample, before drum beats (51 secs). Preliminaries: the preparations before the actual Durga puja begins. Bodhana: the rites to awaken and welcome the goddess to be a guest, typically done on the sixth day of the festival. Adhivasa: anointing ritual wherein many symbolic offerings are made to Durga, where each item represents a remembrance of subtle forms of her. Typically completed on the sixth day as well. Saptami: bathing of the goddess, selection of the priest, elaborate prayers (arati), recitation of texts describing Durga heading to war against evil done on the seventh day of the festival. Mahastami: similar to Saptami, more prayers, recitation and enactment of Durga legends and scriptures on the eighth day. The day is significant because the moment when it ends and ninth day begins is considered the moment Durga kills the buffalo demon, the good once again emerges victorious over evil. Sandhi Puja: one of the most important rituals during Durga Puja, it is a forty eight minute high point that celebrates the climax of war which goddess Durga was engaged in. It is done at the exact time Mahashtami ends and Mahanavami begins, with rituals being performed for the last 24 minutes of Mahashtami and for the first 24 minutes of Mahanavami. The legend behind Sandhi Puja comes from when Durga was engaged in a fierce battle with Mahishasura and was attacked by the demons Chanda and Munda. Goddess Chamunda emerged from the third eye of Durga and killed Chanda and Munda at the cusp of Ashtami and Navami. In some regions, devotees sacrifice an animal such as a buffalo or goat, but in many regions there isn't an actual animal sacrifice and a symbolic remembrance substitutes it. The surrogate effigy is smeared in red vermilion to symbolize the blood spilled. The goddess is then offered food (bhog) by women, and afterwards everyone eats. Major sites celebrating Durga Puja engage in a sixteen part devotional service. The community begins merry making, music, dancing and women playfully smear the faces of their companions with sindoor (vermilion), all as a mark of the victory of good over evil. Mahanavami: the ninth day of festival observes rites similar to Saptami, with the difference that the celebration is after Durga's victory and Vedic style homa (fire oblation) rituals are now included. The other deities on the stage, such as Ganesha, Kartikeya, Lakshmi and Saraswati are remembered and prayers offered to them. Vijaya Dasami: the tenth and last day, begins with Sindoor Khela, where married women smear sindoor or vermillion on the Goddess' idol, on her forehead and feet, before smearing it on each other. Since sindoor is like an ornament for married women, this ritual signifies them wishing each other a happy married life. They also offer bhog to the goddess. It ends with a great procession where the clay statues are ceremoniously walked to a river or ocean coast for a solemn goodbye to Durga. It is an emotional day for some devotees, and the congregation sings emotional goodbye songs. When the procession reaches the water, Durga is immersed, the clay dissolves, and she is believed to return to Mount Kailasha with Shiva and cosmos in general. People distribute sweets and gifts, visit their friends and family members. Some communities such as those near Varanasi mark the eleventh day, called ekadashi, by visiting a Durga temple. Dhunuchi Naach, a dance performed with dhunachi (incense burner) is an integral part of the rituals. Drummers called dhakis, carrying large leather-strung dhak create music, people dance and complete the final day of worship called aarati. The entire process of creation of the sculptures (murti) from the collection of clay to the ornamentation is a ceremonial process. Though the festival is observed post monsoon harvest, the artisans begin making the statues months before, during the summer. The process begins with prayer to Ganesha and to the materials such as bamboo frames in which the statue are cast. Clay, or local soil collected from different parts of the region, forms the base. This choice is a religious tradition wherein Durga, as the creative energy and material, is believed to be present everywhere and everything in the universe. In Kolkata, one custom is to include soil samples, in the clay mixture for Durga, from areas locals believe to be nishiddho pallis (forbidden territories, brothels). The clay base is combined with straw, kneaded then molded into cast made from bamboo. This is set like any clay pot, layered to a final shape, cleaned, and polished when ready. A layer of vegetable fiber called jute, mixed in with clay, is attached to the top to prevent the statue from cracking in the months ahead. The heads of the statues are more complex, and usually cast separately. The limbs of the statues are mostly shaped from bundles of straws. Then, starting about August, the local artisans hand-paint the statues of Durga, Lakshmi, Saraswati, Ganesha, Kartikeya, the lion and the buffalo demon. The goddesses are dressed in fine silk saris, shown bejeweled and put into a pandal. The procedures and proportions of statue (pratima or murti) are described in arts-related Sanskrit text of Hinduism, such as the Vishvakarma sastra. The traditional idols, states Christopher Chapple, are made of biodegradable materials such as "straw, clay, resin, and wood". In the contemporary era, brighter colored statues have increased and diversified the use of non-biodegradable, cheaper or more colorful substitute synthetic raw materials. Environmental activists have raised concerns about the paint used to produce the statue, stating that the heavy metals in these paints pollute rivers when the statues are immersed at the end of the Durga festival. Brighter colors that are also biodegradable and eco-friendly, as well as the historic tradition-based natural colors are typically more expensive. The state of West Bengal has banned the use of hazardous paints, and local Indian governments have started distributing lead-free paints to artisans at no cost to prevent heavy metal pollution. Shakta Hindu communities mark the slaying of buffalo demon and victory of Durga with a symbolic or actual sacrifice. Most communities prefer symbolic sacrifice, where a statue of asura demon made of flour, or equivalent, is immolated and smeared with vermilion to remember the blood that had necessarily been spilled during the war. Other substitutes include a vegetal or sweet dish considered equivalent to the animal. In many cases, Shaktism devotees consider animal sacrifice distasteful, practice alternate means of expressing devotion while respecting the views of others in their tradition. In other communities, an actual animal is sacrificed, mainly at temples of Goddess such as Bhavani or Kali. In Nepal, West Bengal, Odisha and Assam, animal sacrifices are performed at Shakti temples, to mark the legend of goddess Durga slaying the buffalo demon. This involves slaying of a fowl, goat or a male water buffalo. This practice is rare among Hindus, outside the region of Bengal, Odisha, Bihar and Assam. Further, even in these states, the festival season is primarily when significant animal sacrifices are observed. The Rajput of Rajasthan worship their weapons and horses on Navaratri, and formerly offered a sacrifice of a goat to the goddess – a practice that continues in some places. The ritual requires slaying of the animal with a single stroke. In the past this ritual was considered a rite of passage into manhood and readiness as a warrior. The ritual is directed by a priest. The Kuldevi among these Rajput communities is a warrior-pativrata guardian goddess, with local legends tracing reverence for her during Rajput-Muslim wars. Months before the start of Durga puja, youth members of a community organize as a team, collect donations, engage priests and artisans, buy votive materials and help build a theme-based stage called pandal. The Durga statue is designed from clay and clothes and colors by the commissioned artisans. The design and decoration is a team effort involving artists, architects and community representatives hosting it. The budget required for such theme-based pujas is significantly higher than traditional pujas. These attract crowds of visitors. The preparations and the building of pandals are a significant arts-related economic activity, often attracting major sponsors. The growth of competitiveness in theme pandals have escalated costs and scale of Durga Puja in eastern states of India. Some communities question the billboards, the economic competition behind the Durga Puja between communities, and seek return to basics. The competition takes many forms, such as the height of statue. In 2015, an 88-foot statue of Durga in Kolkata's Deshapriya Park attracted numerous devotees, with some estimates placing visitors at one million. Durga puja mood starts off with the Mahishasuramardini – a two-hour radio programme that has been popular with the community since the 1950s. While earlier it used to be conducted live, later a recorded version began to be broadcast. Bengalis traditionally wake up at 4 in the morning on Mahalaya day to listen to the voice of Birendra Krishna Bhadra and the late Pankaj Kumar Mullick on All India Radio as they recite hymns from the scriptures from the Devi Mahatmyam (Chandi Path). A 47 second sample of Dhak playing during Durga Puja. TV and radio channels telecast Puja celebrations. Many Bengali/Assamese channels devote whole days to the Pujas. Bengali and Oriya weekly magazines bring out special issues for the Puja known as "Pujabarshiki" or "Sharadiya Sankhya". These contain the works of many writers both established and upcoming and are thus much bigger than the regular issues. Some notable examples are Anandamela, Shuktara, Desh, Sarodiya Anandabazar Patrika, Sananda, Nabakallol, Bartaman All major local news publications are closed on the last day of the festivities. Durga Kund Temple in Varanasi, a major Durga Puja venue. The style and nature of the Puja varies from being Vedic, or Puranic, or Tantric, or a combination of these. The Bengali Durga Puja typically combines all three. The non-Bengali Durga Puja tends to be essentially Vedic (srauta) wherein the melodies of Vedic hymns are sung, but it too incorporates esoteric elements making the Puja an example of a Vaidik-Tantric practice. Historical evidence suggests that the Durga Puja has evolved over time, becoming more elaborate, social and creative. The festival has been a domestic puja, a form of practice that remains popular. Durga Puja is also practiced in the sarvajanin (public) form, where communities get together, pool their resources and effort to set up pandals, lighting decorations etc. and then celebrate the event as a megashow to share. The origins of the latter variation are unclear, with some evidence suggesting a family in Kolkatta revived this celebration in 1411 CE. Another set of sources suggest that a Bengali landlord named Kamsanarayan held a megashow in 1583, or by others in late 16th century Bengal. Yet, this festival of Bengal is likely much older with the discovery of 11th and 12th century Durga Puja manual manuscripts such as Durgotsavaviveka, Durgotsava Prayoga, Vasantaviveka and Kalaviveka. The rituals associated with the Durga Puja migrated to other regions, from Bengal, such as those in Varanasi, a city that has historically attracted sponsorship from Hindus from various parts of the Indian subcontinent including Bengal. In contemporary India, Durga Puja is celebrated in numerous styles and forms. Durga Idol in Ahiritola, Kolkata (2018). Durga Puja is the biggest and most widely celebrated festival of West Bengal, Bihar, Assam and Odhisa. It is held over a five-day period. The city is decked up with festive lights, loudspeakers play popular songs as well as recitation of mantras by priests, thousands of beautiful pandals are erected by communities in cities, towns and villages across the state, but particularly in Kolkata. The roads become overcrowded with hundreds of thousands of revellers, devotees and pandal-hoppers visiting the pandals on Puja days. It creates a chaotic traffic condition despite all efforts of traffic and crowd management. Shops, eateries, restaurants stay open all night; fairs are set up and cultural programmes are held. People form organizing committees, which plan and oversee the pandal (temporary shrine and stage) for the festivities. Today, Durga Puja has turned into a consumerist social carnival, biggest public spectacle and major art event riding on the wave of commercialisation, corporate sponsorship and craze for award-winning. For private domestic pujas, families dedicate an area of their homes known as thakur dalan for Durga Puja inside which the potters place Durga and then the dressers deck decorate it with home-dyed fabric, sola ornamentation and gold and silver foil decorations. Elaborate rituals like arati are performed and prasad is distributed after being offered to the gods. As a tradition, married daughters return to or revisit their parents and celebrate the Durga Puja together, a symbolism for goddess Durga who is believed to return to her parent's home for the festival. Pictures depicting festival celebration in Patna style during the 18th century. A Durga Puja procession painting from about 1800. Durga Puja is a major gift-giving and shopping season in Bengal, with people buying gifts for not only the family members but also for close relatives and friends. New clothes are the traditional gift, and people wear them to go out together to visit countless Puja pandals. Some people go to the places of tourist attractions during the Puja holidays, while others return home from their workplaces to spend the festive days with their family members. Beyond being a family, social and religious event, Durga Puja has also been a political theatre. Major regional and national political parties have sponsored and leveraged Durga Puja to spread their ideologies given the festival's importance to the culture of Bengali Hindus. According to Claire Alexander and other scholars, the ritual of immersing Durga idol into river attracted the attention of colonial era travelers to the Bengal region from Europe, such as Garcin de Tassy and Emma Roberts. In 1831, Tassy reported that similar rituals were annually observed by Islamic community in Bengal as well. Shia Muslims observed Muharram over 10 days, took out processions in memory of their Imam Husayn ibn Ali, and then cast a memorial Imam's cenotaph into a river on the 10th day. Further, stated Tassy, the Muslim rituals included the same offerings at their annual festival in the memory of their Imam during Muharram, as the Hindus did during Durga Puja. According to Aslam Syed, the immersion in water ritual by Hindus for Durga in Bengal, and Ganesh in the western states of India, may have grown because the Hindu leaders attempted to create a competing procession and immersion ritual to that of Islamic Muharram allowed by the colonial British government in the 19th and early 20th century. Nashik holds four major celebrations – including: the Government of India Press grounds organised by Nashik Sarbojanin Durga Puja Committee which is the oldest and biggest; the Hindustan Aeronautics Limited (H.A.L)in Ojhar; at Artillery Station, Deolali; the industrial area of Satpur-Ambad. In recent years, places such as CIDCO, Rajeevnagar, Panchavati and Mahatmanagar also have set up Durga Puja mandals. In 1910, a year before Delhi was declared the capital of British India, the first Sarbojanin (community) puja in Delhi was organised near Kashmiri Gate by a group of expatriate Bengalis, including the doctor Hemchandra Sen. This group became the Delhi Durga Puja Samiti, popularly known as the "Kashmere Gate Puja". The Timarpur puja (near Delhi University) started in 1914. In 2011, over 800 pujas were held in Delhi, with a few hundred more in Gurgaon and Noida. There were over 2500 community celebrations in Tripura as of 2013. Durga Puja began over 200 years ago at the Durgabari temple in Agartala, started by King Radha Kishore Manikya Bahadur. Durga Puja is widely celebrated by the Bangladesh's minority Hindu community. Some Bengali Muslims also take part in the pujo (Durga Puja). In Dhaka, the Dhakeshwari Temple and mandaps attract numerous visitors and devotees, and on Vijaya Dashami, the immersion processions head to Sadarghat (Dhaka's river port), where the idols are immersed. Durga Puja started in Sri Lanka in 2014, by Colombo Durgotsav Cultural Organisation (CDCA). It is attended mainly by expat Indians, Bangladeshis, Nepalis and local Tamils. Many Sinhalese Buddhists too attend the programs and pujas in this annual cultural confluence festival held at New Kathireshan Hall, Bambalapitiya, Colombo. In the recent past, Durga Puja celebrations and festivities were also started in Hong Kong by the Bengali diaspora. Durga Puja in Nepal is called Dashain. Durga Puja is organized by some Bengali communities in the United States. Durga Puja is organised by Bengali communities in Europe. Although pandals are not constructed, the sculptures are imported from India. According to BBC News, for community celebrations in London in 2006, these "idols, belonging to a tableau measuring 18ft by 20ft, were made from clay, straw and vegetable dyes". At the end of the Durga Puja, these were immersed in River Thames, for the first time in 2006, after "the community was allowed to give a traditional send-off to the deities by London's port authorities". The Bengali community stated, per the BBC News report, that the immersion ceremony "is a very sentimental issue for us, everybody wanted to see the idols being given a proper immersion". In Germany, Durgapuja is celebrated in several cities across the country. Some of the top mentions are "Duesseldorf Durgapuja", who have been celebrating this since 2012 with the same zeal and vigour as in India. The Indische Gemeinde Duesseldorf is the organization which manages this 4 day extravaganza with voluntary support from members of the club and first time visitors alike. The event consists of performing all rituals to the book, Prasad after the puja, Indian Lunch, Dinner and snacks every day for all visitors, Cultural programmes from members of the club as well as by performing artists flown out of India, and Sandhya Arati (Evening worship) along with the Dhak (traditional drum) and kansor (traditional metal disc). 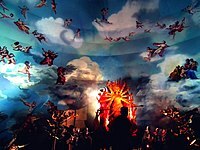 The biggest Durga Puja in Germany is celebrated in Cologne Durga puja;. It is also celebrated in Munich, Berlin and other German cities. In Switzerland, the 'Swisspuja' group based in Baden, Aargau, in northern Switzerland, has been celebrating Durga Puja since 2003. In Sweden Durgapuja is celebrated in many places like Stockholm and Helsingborg. A group 'Bengali Cultural Society - South Sweden (BCSOFSS)' based on Helsingborg has started Durgapuja since 2017. In Netherlands Durgapuja is celebrated in several places like Amstelveen, Eindhoven and Voorschoten. Bengali community 'Holland-e-Hoichoi' and 'Anandadhara Netherlands' has started Durga Puja in Amstelveen (close to Amsterdam) since 2017. ^ In the Shakta tradition of Hinduism, many of the stories about obstacles and battles have been considered as metaphors for the divine and demonic within each human being, with liberation being the state of self-understanding whereby a virtuous nature and society emerging victorious over the vicious. ^ It appears in Khila (appendix, supplementary) text to Rigveda 10.127, 4th Adhyaya, per J. Scheftelowitz. ^ Various versions of Devi mantra exist. Examples include: [a] "We know the Great Goddess. We make a meditation of the goddess Durga. May that Goddess guide us on the right path. (Durga Gayatri Mantra, recited at many stages of Durga puja); [b] Hrim! O blessed goddess Durga, come here, stay here, stay here, take up residence here, accept my worship. (Durga Avahana Mantra); etc. ^ a b "Durga Puja Tithi and Timing". Retrieved 17 July 2012. ^ a b c d James G. Lochtefeld 2002, p. 208. ^ a b c d e f g h Cynthia Bradley 2012, p. 214. ^ a b c David Kinsley 1988, pp. 106-108. ^ a b c d e f Encyclopedia Britannica 2015. ^ a b J. Gordon Melton (2011). Religious Celebrations: An Encyclopedia of Holidays, Festivals, Solemn Observances, and Spiritual Commemorations. ABC-CLIO. pp. 239–241. ISBN 978-1-59884-206-7. ^ a b Laura Amazzone 2011, pp. 82-83. ^ a b c Rachel Fell McDermott 2001, pp. 172-174. ^ Hillary Rodrigues 2003, pp. 7-8. ^ a b Alain Daniélou 1991, p. 288. ^ a b June McDaniel 2004, pp. 215-219. ^ a b June McDaniel 2004, pp. 20-21, 217-219. ^ a b c d David Kinsley 1988, pp. 111-112. ^ Henrike Donner (2016). Domestic Goddesses: Maternity, Globalization and Middle-class Identity in Contemporary India. Routledge. p. 25. ISBN 978-1-317-14848-7. ^ James G. Lochtefeld 2002, pp. 212-213. ^ a b Constance Jones & James D. Ryan 2006, pp. 308-309. ^ Wendy Doniger 1999, p. 306. ^ Parmita Borah (2 October 2011). "Durga Puja – a Celebration of Female Supremacy". EF News International. Archived from the original on 25 April 2012. Retrieved 26 October 2011. ^ "Durga-puja.org". Durga-puja.org. 6 October 2012. Retrieved 25 June 2013. ^ J. Scheftelowitz (1906). Indische Forschungen. Verlag von M & H Marcus. pp. 112 line 13a. ^ David Kinsley 1988, pp. 95-96. ^ Rocher 1986, pp. 191-195. ^ Lawrence A. Babb; John E. Cort; Michael W. Meister (2008). Desert Temples: Sacred Centers of Rajasthan in Historical, Art-historical, and Social Context. Brill. pp. 8, 65–68, 86–89. ISBN 978-81-316-0106-8. ^ Cheever Mackenzie Brown 1998, p. 77 note 28. ^ Coburn 1991, pp. 13. ^ Coburn 2002, pp. 1-7. ^ Rachel Fell McDermott 2001, p. 162. ^ Rachel Fell McDermott 2001, pp. 162-163. ^ Rachel Fell McDermott 2001, pp. 162-164. ^ David Kinsley 1997, pp. 16-22, 30-35. ^ C. Mackenzie Brown 1990, pp. 280 note 50, 274 notes 103, 107, 109-110. ^ Pranab Bandyopadhyay (1993). Mother Goddess Kali. UW Press. p. 118. ISBN 978-81-85328-15-7. ^ Patricia Monaghan 2009, pp. 151–153. ^ Rachel Fell McDermott 2001, p. 330 notes 98-103. ^ Tithi Bhattacharya (November 2007). "Tracking the Goddess: Religion, Community, and Identity in the Durga Puja Ceremonies of Nineteenth-Century Calcutta". The Journal of Asian Studies. 66 (4): 919–962. doi:10.1017/s0021911807001258. ^ a b Pratapacandra Ghosa (1871). Durga Puja: with notes and illustrations. Calcutta: Hindoo Patriot Press. pp. 40–55. ^ Amazzone 2012, pp. 55-59. ^ David Kinsley 1988, p. 111, Quote: "Durga puja is celebrated from the first through the ninth days of the bright half of the lunar month of Asvin, which coincides with the autumn harvest in North India, and in certain respects it is clear that Durga puja is a harvest festival in which Durga is propitiated as the power of plant fertility"..
^ Malcolm McLean 1998, p. 137. ^ a b Amazzone 2012, pp. 57-59, 63, 66. ^ Charles Russell Coulter & Patricia Turner 2013, pp. 148, 158-159, 256-257, 301. ^ Amazzone 2012, pp. 58-60. ^ Amazzone 2012, pp. 69-70, 83-84, 95-97, 115-117, 184. ^ June McDaniel 2004, pp. 209-210. ^ Robert S. Ellwood & Gregory D. Alles 2007, p. 126. ^ "Introduction to Devi Mantra". indif.com. Retrieved 6 March 2012. ^ Hillary Rodrigues 2003, pp. 50, 150-151. ^ C. Mackenzie Brown 1990, pp. 143-147. ^ Hillary Rodrigues 2003, pp. 153-155, 63, 90, 177 etc. ^ Hillary Rodrigues 2003, p. 113. ^ Hillary Rodrigues 2003, pp. 17-24, 31-39. ^ Hillary Rodrigues 2003, pp. 71-74. ^ Hillary Rodrigues 2003, pp. 38-44, 84-87. ^ Hillary Rodrigues 2003, pp. 44-45, 120-127. ^ Hillary Rodrigues 2003, pp. 46-54, 132-136. ^ Hillary Rodrigues 2003, pp. 57-59, 194-197. ^ Hillary Rodrigues 2003, pp. 210-213. ^ Hillary Rodrigues 2003, pp. 62-63, 224-229. ^ Hillary Rodrigues 2003, pp. 67-68. ^ a b c d e Nilima Chitgopekar (2009). Book Of Durga. Penguin Books. pp. 95–98. ISBN 978-0-14-306767-2. ^ Vikas Khanna (2015). Indian Harvest: Classic and Contemporary Vegetarian Dishes. Bloomsbury Academic. p. 96. ISBN 978-1-63286-200-6. ^ Amazzone 2012, p. 57. ^ Saligrama Krishna Ramachandra Rao (1988). Pratima Kosha: Descriptive Glossary of Indian Iconography. IBH Prakashana. pp. 47–49, 209. ^ a b Christopher Chapple (2000). Hinduism and ecology: the intersection of earth, sky, and water. Harvard University Press. pp. 490, 484–489. ISBN 978-0-945454-25-0. ^ Phoebe Godfrey; Denise Torres (2016). Emergent Possibilities for Global Sustainability: Intersections of Race, Class and Gender. Routledge. pp. 98–99. ISBN 978-1-317-57017-2. ^ Pati, Ipsita (18 October 2012). "Paint with toxic chemicals banned during Puja". The Hindu. ^ June McDaniel 2004, pp. 204-205. ^ Ghosha, Pratápachandra (1871). Durga Puja: with notes and illustrations by Pratápachandra. Calcutta: Hindoo Patriot press. pp. 60–65. ^ Charles Phillips, Michael Kerrigan & David Gould 2011, pp. 98-101. ^ a b Fuller Christopher John (2004). The camphor flame: popular Hinduism and society in India. Princeton University Press. pp. 46, 83–85. ISBN 978-0-691-12048-5. ^ Hiltebeitel, Alf; Erndl, Kathleen M. (2000). Is the Goddess a Feminist? : the Politics of South Asian Goddesses. Sheffield, England: Sheffield Academic Press. p. 77. ISBN 9780814736197. ^ Harlan, Lindsey (1992). Religion and Rajput Women. Berkeley, California: University of California Press. pp. 61, 88. ISBN 978-0-520-07339-5. ^ Harlan, Lindsey (1992). Religion and Rajput Women. Berkeley, California: University of California Press. pp. 107–108. ISBN 978-0-520-07339-5. ^ Hillary Rodrigues 2003, pp. 1-2, 10-11, 24-26, 351-352. ^ "Puja on the billboards" The Telegraph, 13 September 2009. ^ "Have you ever seen a Durga Idol this tall". Rediff. Rediff. Retrieved 3 November 2015. ^ "Near stampede shuts down Deshapriya Park Durga Puja". The Times of India. Retrieved 3 November 2015. ^ "Indian Festival History – Durga Puja". Indian Festival. Archived from the original on 4 November 2013. Retrieved 2 October 2011. ^ Mahalaya ushers in the Puja spirit The Times of India, 19 September 2009. ^ Hillary Rodrigues 2003, p. 17. ^ a b c Hillary Rodrigues 2003, pp. 17-18. ^ Hillary Rodrigues 2003, p. 18. ^ a b Hillary Rodrigues 2003, pp. 18-19. ^ McDermott 2011, pp. 12-14. ^ Hillary Rodrigues 2003, pp. 20-27. ^ Hillary Rodrigues 2003, pp. 17-21. ^ McDermott 2011, p. 11. ^ Hillary Rodrigues 2003, pp. 27-28. ^ a b Hillary Rodrigues 2003, pp. 27-29. ^ McDermott 2011, pp. 138-143. ^ Hillary Rodrigues 2003, pp. 27-30. ^ Hillary Rodrigues 2003, pp. 27-30, 39-48, 58-64, 106-114. ^ Hillary Rodrigues 2003, pp. 27-32. ^ Hillary Rodrigues 2003, pp. 27-32, 64-75. ^ Claire Alexander; Joya Chatterji; Annu Jalais (2015). The Bengal Diaspora: Rethinking Muslim Migration. Routledge. pp. 190 note 76. ISBN 978-1-317-33593-1. ^ David Jones; Michele Marion (2014). The Dynamics of Cultural Counterpoint in Asian Studies. SUNY Press. pp. 97–98. ISBN 978-1-4384-5191-6. ^ Sumita Sarkar (6 October 2015). "Kumbh Mela delay fails to dampen Durga Puja preparations". The Times Of India. ^ "Durga Puja". The Hindu. Chennai, India. 6 August 2009. Retrieved 1 October 2011. ^ "Durga Puja, Durga Puja in Tripura, Durga Puja in North East of India, Tripura Durga Puja, Durga Puja in India, Fairs and Festivals in Tripura, Tripura Fairs and Festivals, Fairs and Festivals in India, Festivals in North East of India, Indian Holiday". www.indianholiday.com. Retrieved 27 September 2017. ^ "Durga Puja begins in Tripura with traditional guard of honour to Goddess". Jagran Post. Retrieved 27 September 2017. ^ Salil Tripathi (2016). The Colonel Who Would Not Repent: The Bangladesh War and Its Unquiet Legacy. Yale University Press. p. 5. ISBN 978-0-300-21818-3. , Quote: "The intertwining of cultural traditions reinforced a society which was tolerant and the faiths borrowed from each other. (...) Many Bangladeshi Muslim women wear saris and bindis, or teeps, the dot on their forehead, usually seen only among Hindu women; they celebrate pujo, a Hindu festival for the goddess Durga, and they have no hestitation ushering in Poyla Baisakh, to celebrate the Bengali new year." ^ Ellen London (2004). Bangladesh. Gareth Stevens. p. 38. ISBN 978-0-8368-3107-8. ^ "The HKyantoyan The Hong Kong Indian Lifestyle Portal". ^ "BBC Thames immersion for Hindu sculptures". BBC UK. 2 October 2006. Retrieved 4 October 2011. ^ "Durga Puja in Switzerland". www.swisspuja.org. Retrieved 29 October 2016. Banerjee, Sudeshna (2004). Durga Puja: Yesterday, Today and Tomorrow. Rupa and Co, Calcutta. ISBN 81-291-0547-0. Bhattacharyya, BK (6 October 2008). "Earthen sculptures of Goddess Durga". The Assam Tribune. Archived from the original on 1 April 2012. Dutta, Krishna. (2003) Calcutta: a cultural and literary history. Signal Books, Oxford, United Kingdom. ISBN 1-902669-59-2. Saraswati, Swami Satyananda (2001). Durga Puja Beginner, Devi Mandir. ISBN 1-887472-89-4.